A prominent long-vacant lot on the edge of the Downtown Eastside is about to be developed by the company also building the Trump Tower. But because of a city zoning policy put in years ago and the developer’s preference for something different, the new building at the rapidly transforming corner of Hastings and Abbott across the street from the Woodward’s project will be a rental. The 132-unit building is being designed by architect Gair Williamson, who has done a number of unique projects in the Downtown Eastside, Chinatown and Strathcona, including The Keefer, the Paris Block and the Paris Annex, and projects that combine social and market rentals. The Holborn lot, which used to house a one-storey building that had a food market in its last incarnation, has sat vacant for years. In the decade since Holborn bought the site, the area has changed dramatically. Between the Woodward’s development and a number of other new buildings or restorations of historic buildings in the area, the blocks around Hastings and Abbott have seen once-vacant sites transform into hip coffee shops, restaurants and furniture and clothing stores. That has brought in a flood of new residents and shoppers, but dismayed long-time advocates for the Downtown Eastside who fear the gentrification they say is squeezing people out of what was once the cheapest area to live in Vancouver. 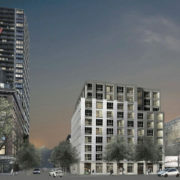 The sometimes controversial company, which is about to open its Trump Tower project on Georgia Street next month and has finally come up with a plan for its redevelopment of the Little Mountain social-housing site in central Vancouver, and Mr. Williamson have worked on various ideas for redevelopment during that time. One was for a 150-foot building, but city planners rejected that. The new design is only 105 feet and has design elements that echo older industrial buildings in the area, built with aluminum and zinc and featuring the kind of paned windows, rather than large sheets of glass, more common in the city’s older buildings. Mr. Williamson said he is aiming to provide a transitional building that bridges the space between Woodward’s, across the street, and the historic Paris Block building, two lots down the block from the Holborn site. Although it has an industrial look, “we’re trying to give a grandeur to this building,” he said. 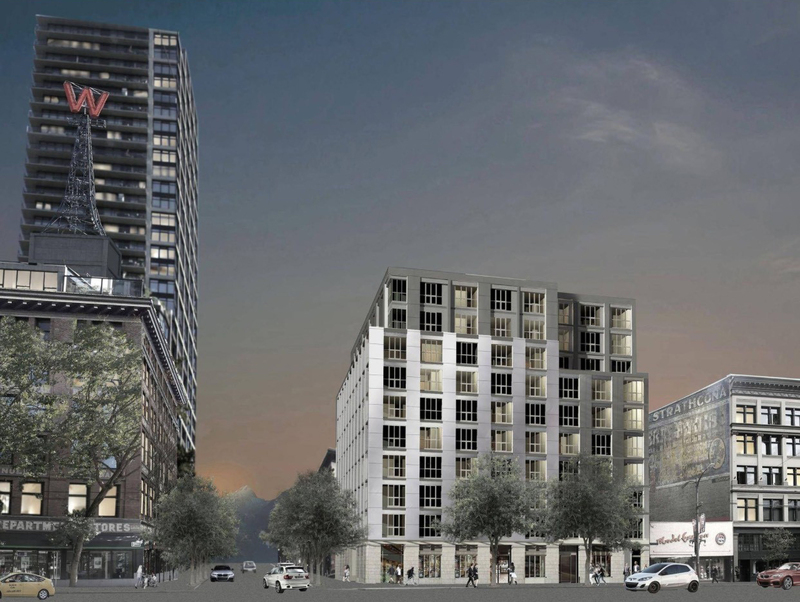 The project will require a rezoning under the city’s policy for the Victory Square area, which potentially allows for sites to get greater density if the owners are providing social housing, 100-per-cent market rental or the restoration of a heritage building. The site currently allows a developer to build up to five times the size of the lot, without any special permission. The planned project is about 50 per cent more than that. Mr. Williamson said a third of the units in the building will be two-bedrooms, to provide spaces for families, something the city has been aggressively pushing in recent years. The city’s policy for Victory Square doesn’t have any mechanism for dictating what the rental rates might be. Mr. Scott said it’s too early in the project yet to say definitely what the units might rent for. Mr. Williamson said he thinks the building will be especially appealing to people because it will include a lot of amenities, due to the way the building has to be designed because of the lot size and shape and its proximity to a site next door that will be developed in future. His project currently has a three-storey, multi-use recreation court built into the east side of the building, along with exercise rooms, workshops, outdoor gardens, and more. “This project is almost a city in itself,” said Mr. Williamson. The proposal will be presented at a community open house Jan. 26 at nearby Vancouver Community College.